The festival of Chanukah approaches. The central focus of the Chanukah story was the attempt by the Greeks in the second century BCE, to force the Jewish people into giving up our belief in G-d and in the Torah, our ritual observance, our values and our culture. It was a desire to eradicate the Jewish people as a people, by stopping Jewish continuity. As much as the battle was external, it was also internal. Jewish Hellenists believed that the best way forward was to adopt idol worship and assimilate into the Greek way of life. The tyrant Antiochus IV, opposed the Jewish High Priest Yochanan, who readily realised the dangers to Jewish continuity and resisted both the external and internal trends. Antiochus replaced Yochanan with Yochanan’s brother, Joshua, a Hellenist Jew, who changed his name to Jason—a Greek name as a sign of assimilation. Eventually when this was not effective enough, Antiochus sent his army to slaughter thousands of Jews, forced a cessation of Jewish practice and compelled the Jews under the threat of death, to worship pagan gods. It was in the town of Modiin—approximately where the modern Israeli town of Modiin is found today—that the first serious resistance occurred, led by Mattityahu and his sons. Before Mattityahu’s death, he named Judah as the leader of the resistance and they became known as the Maccabees. 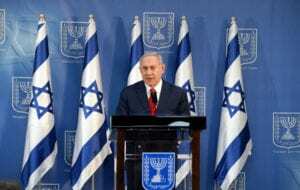 …it does not matter when the elections take place, the winner will be Netanyahu—again. Despite overwhelming odds and facing an army of some 40,000 men, the Maccabees prevailed, rededicated the Temple and the miracle of one day’s supply of oil for the Menorah actually lasting eight days, took place. And the Jewish way of life continued, belief in G-d, observance of the mitzvoth and today, the rebirth and renaissance of the Jewish people in the Jewish homeland. Jews today once again are living in the thriving city of Modiin and roaming the Hills of Judea. It is quite amazing how history repeats and parallels itself. Today once again, Israel is surrounded by many groups of people who want to destroy the Jewish way of life and who want to eradicate the Jewish State. Once again it is the few against the many. Once again the world stands by. And yet, once again it is Israel that prevails. We have just this month seen nearly 500 rockets in 48 hours launched against Israel’s civilian population. Prime Minister Netanyahu, who has a consistent record of using military force only after other methods have failed, agreed to a ceasefire with Hamas. Many residents from the south protested the ceasefire and had an understandable dissatisfaction with it having to live under the rocket fire itself. As undesirable as the consequences of military action would be, no-one really believes Hamas will keep the ceasefire and whilst military action will not permanently resolve the issue, it will probably buy some few years of better living conditions for the people living in the southern parts of Israel. However, it is hard to see how in future such rocket fire will result in the same Israeli restraint. Notwithstanding the ceasefire agreement, Prime Minister Netanyahu is seen as “Mr Security” and consistently outpolls any rival for the Israeli leadership. All pundits agree that barring some legal event, it does not matter when the elections take place, the winner will be Netanyahu—again. The only question is who will become his junior coalition partners. Election fever raged briefly in Israel as a result of the resignation of Defence Minister Avigdor Lieberman, taking his party with him and leaving the current coalition with just a razor slim majority of 61 seats in a 120 seat parliament. At the end of the day, only Netanyahu has the standing to bring Israel along to face up to and deal with any challenges. To many he is a modern day Maccabee. Together with our Christian friends we recall the story of Chanukah and how by standing by our values and beliefs, we will overcome whatever challenge presents itself.